Unlike the violent Robocop of American movie fame, this non-violent robot cop spends it's time spreading anti-theft and anti-triad messages. It's key features were contributed by students who won a design competition. It features a hidden LCD panel, wireless technology and infrared sensors. Thanks to Roland Piquepaille's Technology Trends blog by way of BoingBoing. 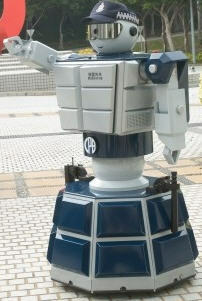 See also Locally-built robot set to become Hong Kong's latest cop from ChannelNewsAsia.com.